The basic American bargain is that people who work hard and meet their responsibilities should be able to get ahead. This basic bargain is not just an idea—it is embedded in laws that promote equal access to jobs and that protect workers from unfair practices. However, for workers who are lesbian, gay, bisexual and transgender (LGBT), this bargain is broken. A Broken Bargain: Discrimination, Fewer Benefits and More Taxes for LGBT Workers examines how job discrimination without legal protection makes it harder for LGBT workers to find and keep a good job; and how LGBT workers receive fewer benefits and pay more taxes, which puts LGBT workers and their families at risk. The report also offers recommendations for how federal, state and local governments, as well as employers, can reduce barriers to finding and keeping a good job and provide equal access to individual and family benefits. A Broken Bargain was co-authored by the Movement Advancement Project, the Center for American Progress and the Human Rights Campaign, in partnership with Freedom to Work, the National Center for Transgender Equality, the National Partnership for Women & Families, Out & Equal Workplace Advocates, and SEIU—and features a foreword by Small Business Majority. Movement Advancement Project, Center for American Progress, and Human Rights Campaign. June 2013. A Broken Bargain: Discrimination, Fewer Benefits and More Taxes for LGBT Workers. 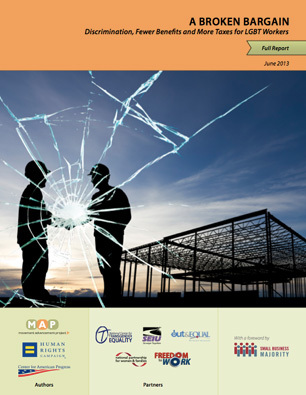 http://www.lgbtmap.org/a-broken-bargain-full-report (date of access).